We got to see Shutter Island last night after anticipating it for months. I'm happy to say that I thought it was awesome. The visuals were stunning, the story was unique and atmosphere was brilliant. 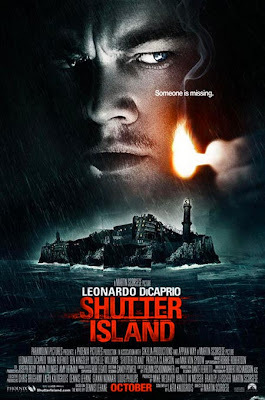 Shutter Island is about a Federal Marshall who is called to investigate a missing patient from a mental institution that houses some of the most atrocious patients. One such patient is the one that is missing; she drowned her three children. It seems that no one is too helpful there and there are secrets that Teddy (Leonardo DiCaprio) is trying to find out and expose. From there I'll let you see it on your own because it's hard to tell a lot about it without sharing the ending or telling too much. The scenes where Teddy's late wife (Michelle Williams) appears are breathtaking and some of the best of the entire movie. Ben Kingsley is top notch as usual. It's rated R and there's enough gore, flashbacks and shocking material to satisfy everyone who likes a little harsh "reality" with their entertainment. This gets a 5/5 rating from me and I can't wait to see it again to pick up a few things I might have missed.